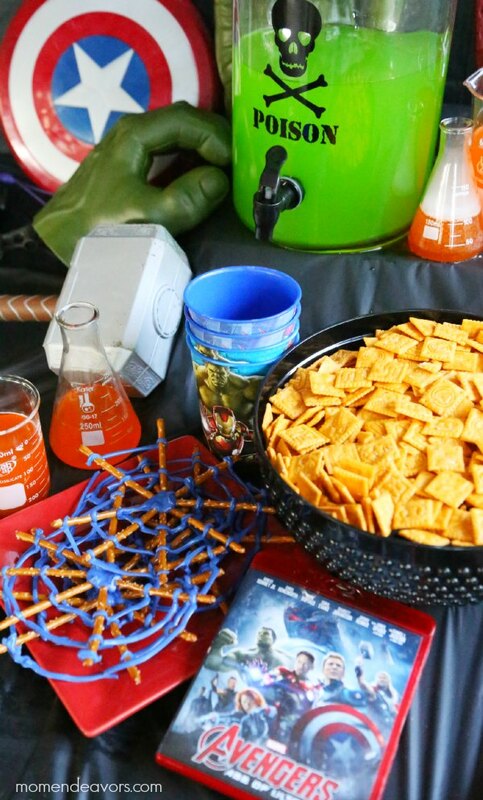 Who’s ready for some Avengers party fun?! MARVEL’s The Avengers: Age of Ultron just hit stores on DVD, so it’s the perfect time to have a movie watch party! And, no doubt for Halloween this year, our favorite superheros will be a popular choice. 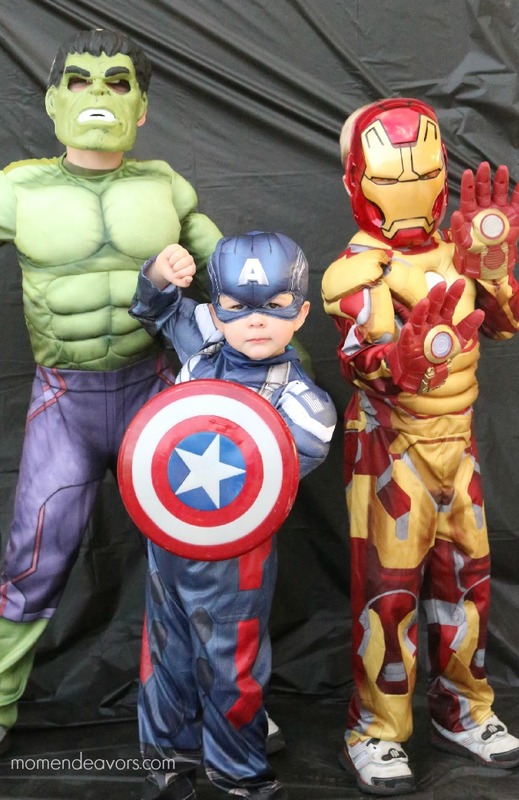 So, why not have a little Avengers costume party for Halloween – fun for kids and adults! Obviously, costumes are a must for a costume party! 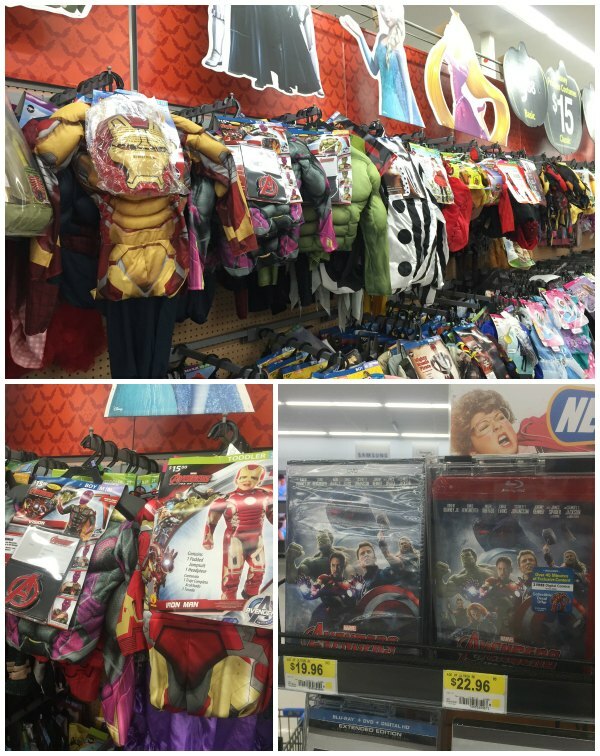 And, there are some great prices on Avengers costumes at Walmart. I picked up these costumes for just $15 each, which is a great deal! My boys LOVE dressing up still anytime (not just at Halloween), so these are going to be a big hit for quite sometime! For added party fun, you can set up a super simple photo booth by just hanging a plastic tablecloth. I like using black so it doesn’t clash with anyone’s costumes! So easy and everyone LOVES doing their best superhero pose!! Don’t the costumes look great? For just $15 each, I was really impressed! 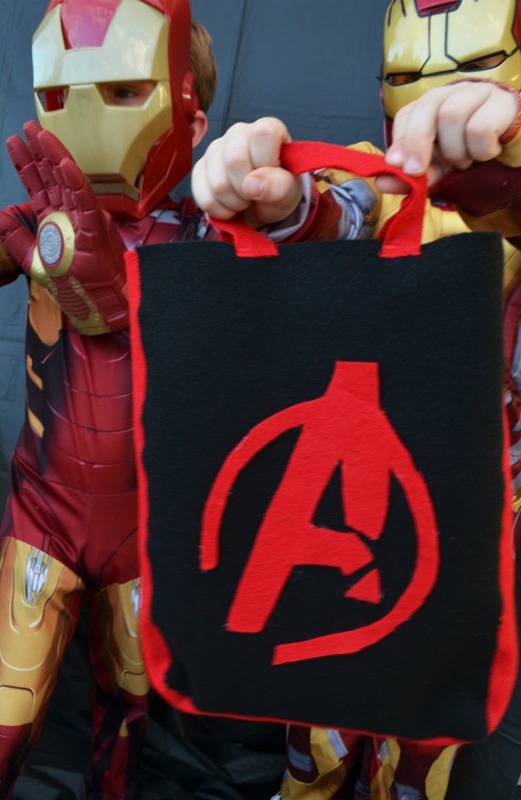 For added photo booth fun or for going trick-or-treating, you can even make some DIY Avengers bags! These would be great party favors too (directions link coming soon)!! Food is key to any party! 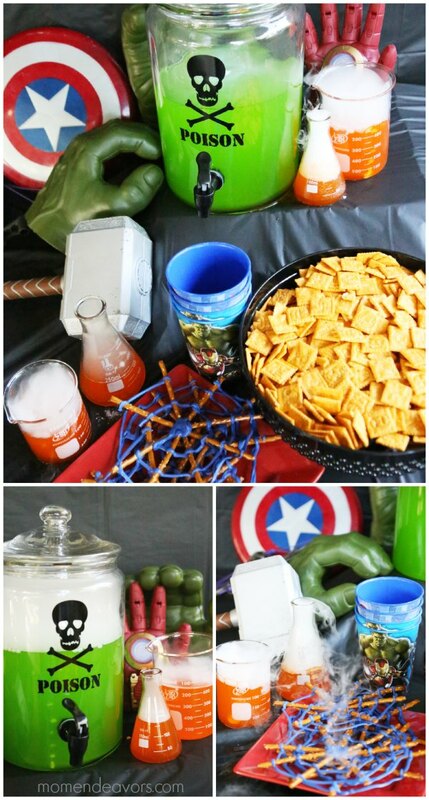 If you really want to go all out, you can check out our other Avengers party for more details. I kept this one more simple and gave it a little Halloween flare! One thing that seems to tie into both Halloween and the whole Marvel Universe is a science lab. So, I went with that for a tablescape theme! It was SO simple, but everyone loved it! We used some costume accessories for some added decor (Captain America’s Shield, Thor’s Hammer, etc) and then just did a few fun foods. Dry ice is an especially great item for any kind of science lab party! You can see how fun the addition of dry ice is in our party Instagram video here. 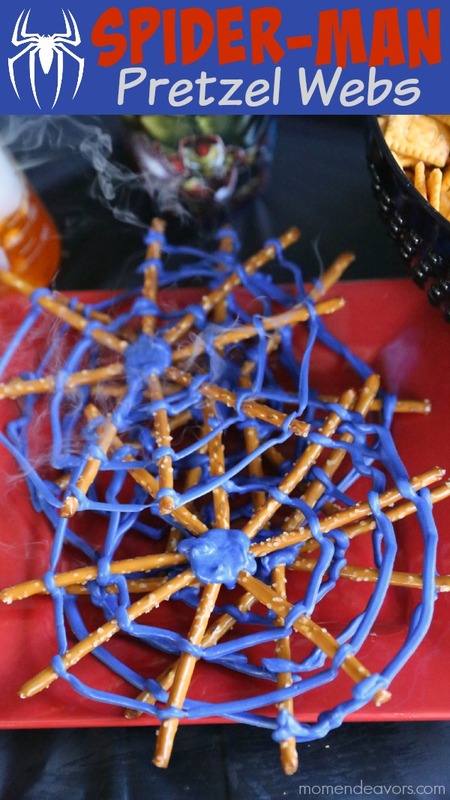 As always, the spider web pretzels (<–click here for directions)were a HUGE hit! These are SO popular with the kids and one of the #1 viewed posts on the whole blog! With Spider-Man as part of the Marvel Universe, I decided to make the web blue on these (sort of an easier version of my Spider-Man Pretzel Pops). Plus, the spider theme works perfectly for Halloween. So, these pretzel webs were a great addition!! Last but not least, you need a few activities for your party! With older kids and adults, obviously just movie-watching is fun! But with younger kids (who the movie might not be appropriate for), you can do some fun activities! Coloring in your costume is always fun! 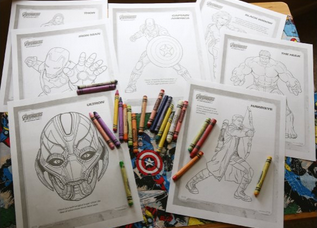 Iron Man, Hulk, Captain America, etc can all color their own self-portraits! 😉 You can download the free coloring pages here. You can have some of the pages printed out on the coffee table for anyone to color during movie-watching too! I love having coloring pages out at parties! But, a fun movement activity or two is always good (especially so when dealing with kids). So we did a fun Ghost bowling game. 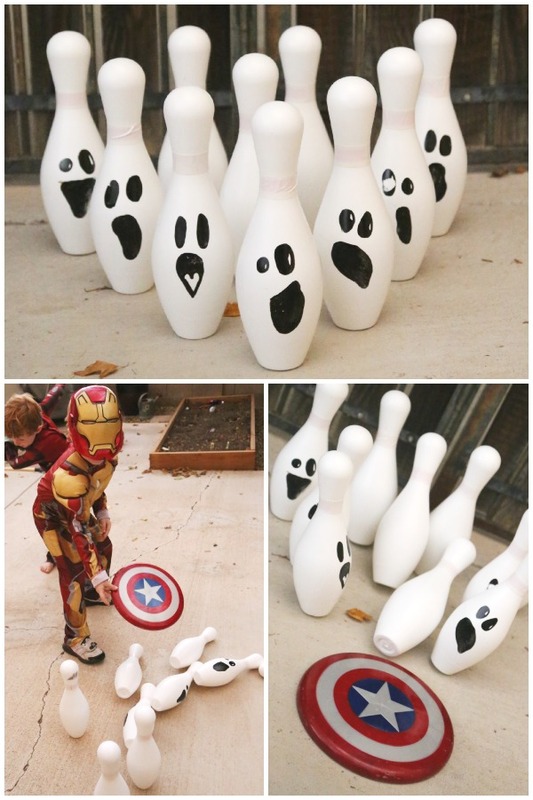 Just draw some ghost faces on some bowling pins and have the superheroes knock those ghoulies out! To make it even more Avengers-themed, you can have participants use their special tools to get the ghosts (like Captain America’s Shield, Thor’s Hammer, etc). Fun, right?! 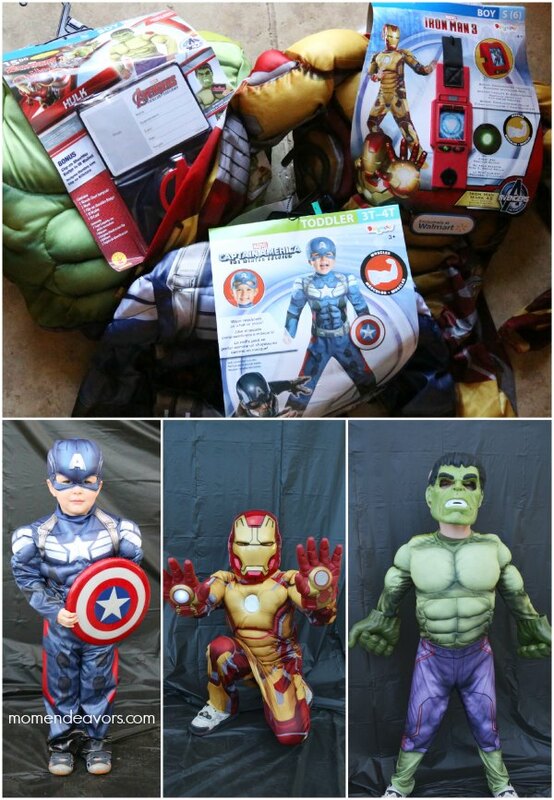 With just a few twists, you can easily turn a regular Halloween party into a whole superhero costume party! For party supplies, I picked up everything I needed at Walmart. You’ll find a large selection of costumes in the Halloween area and MARVEL’s The Avengers: Age of Ultron DVD in electronics! So be sure to check out all the fun MARVEL character costumes! Does your family MARVEL Halloween costume plans? This party is AMAZING!! So many adorable touches. Thanks for the inspiration!